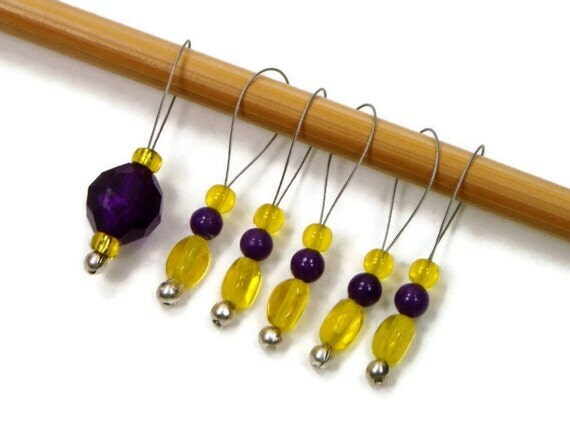 These yellow and purple stitch markers for knitting are fun and functional. Keep track of important spots in your knitting pattern with these special markers. The unique marker bead is for marking the beginning of a round in circular knitting. My stitch markers are made with nylon coated wire which gives them that teardrop shape. The markers are shown on US size 10 1/2 needles, but knitters can use them on almost any size needle because the beads will hang lower than the stitches and not interfere with the current row. They also slide from needle to needle easily. The come on a gold or silver plated earring wire for easy storage.